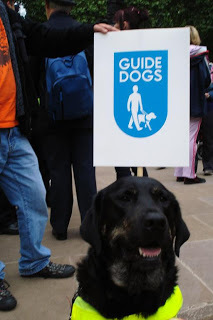 Hope you don’t mind but I have copied the information from the RNIB website about the planned march next week. I went on the first one in London in April and I think it is very important that everyone is aware that the government ‘changes’ to disability benefits are going to directly affect the most vulnerable people in society. Its grotesque especially in the way is is all being done ‘undar the radar’. You may think it doesn’t affect you but it will in the long run. Please, if you are near any of the places listed below, do turn up and show compassionate support. I’ll be at the Norwich do with the groovy hound! If you are concerned that you or someone you know may be affected by planned benefits changes contained in the Welfare Reform Bill and by cuts to services locally, there is an action you can take in nine days’ time. Please join us at a Hardest Hit event in your region on 22 October to make your voice heard. You will be supporting other disabled people, people with long term conditions, their friends and family who are speaking out about the impact of planned cuts as the Welfare Reform Bill makes its way through Parliament. Changes to contributory Employment and Support Allowance – including proposals for a 12 month time limit on benefits for people who lose their sight (and their job). Changes to Disability Living Allowance – including proposals to end automatic entitlement to the benefit that replaces DLA, including the higher rate mobility component for people who are deafblind, or severely visually impaired. We cannot underestimate the impact these proposed changes will have on blind and partially sighted people, and everyone living with a disability. 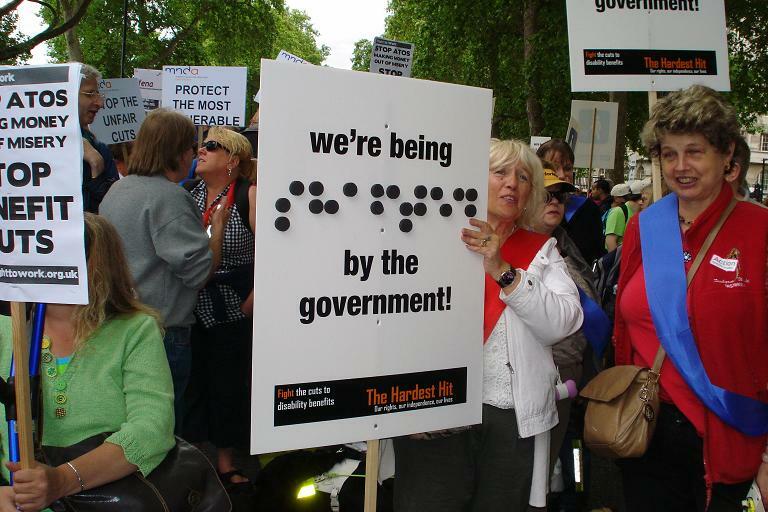 Please join us at one of the 12 events taking place across the UK to send a clear message to Government – you are hitting disabled people and their families the hardest: stop unfair welfare cuts. •Belfast: Debate at the Radison Blu Hotel in Belfast on the Welfare Reform Bill’s impact on disabled people’s freedom and independence. Please note the Belfast event is on 20 October and starts at 1.30pm. Visit the Hardest Hit website to sign up to attend. •Birmingham: Rally in Victoria Square, in the city centre on 22 October. Assemble from noon and the rally will begin at 12.30pm. •Brighton: Rally at Jubilee Square, Jubilee Street, Brighton on 22 October. Gather from 11am with speeches between 11.30 – 12.30pm. •Bristol: March on 22 October beginning on College Green, outside the Council House, at the bottom of Park Street, from 12 noon – 1.00pm. Return to College Green for a rally from 1.00pm – 2.00pm. •Cardiff: March and rally on 22 October. Assemble from 12.30 in the car park outside City Hall, Cathays Park. Speeches from 1.00, followed by a march and returning to City Hall for a rally at 2.00pm. •Edinburgh: Rally on 22 October. Assemble from 11.00am at the Ross Bandstand in Princes Street Gardens in Central Edinburgh. Rally starts at 12 noon. •Leeds: Assemble on 22 October at Victoria Gardens, outside Leeds Art Gallery on Headrow, from 12.30pm for march through main shopping areas and returning to Headrow. Rally from 2.00 – 2.30pm. •London: Rally on 22 October outside London’s iconic GLA building (City Hall), Queen’s Walk. Meeting from 11.00am with speeches from 11.30am. •Manchester: Rally on 22 October between 2.00pm and 3.00pm at Albert Square, outside Manchester Town Hall. •Newcastle: March and rally on 22 October. The march will leave Bigg Market at10.30am, walking to the Monument for rally at 11.30am. Ends at 12.30pm. •Norwich: March and rally on 22 October. Assemble from 11.30am at Chaplefield Gardens in the centre of Norwich. March starts at noon and returns to Chaplefield Gardens for the rally at 1.00pm. •Nottingham: Rally on 22 October. The rally is taking place in Old Market Square, just outside Nottingham Council House from 12.30pm to 13.30pm.